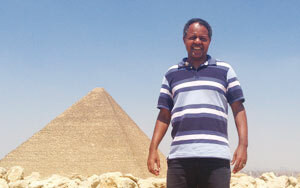 For Menghestab Haile, GIS is about transforming development. “GIS will accelerate development—if we can manage to make it understandable for decision-makers,” he said. To him, leaders are the key to precipitating progress. “If you really want to make a difference in a country or on a continent, you really need to have the decision-makers on board,” he added. But across Africa, where Haile has focused his career, many governments don’t have the information they need to make informed decisions. As the country director and representative for the World Food Programme’s (WFP) Egypt Country Office, he is in a prime position to link leaders to GIS. And that is exactly what he is doing. Working in partnership with Egypt’s Central Agency for Public Mobilization and Statistics (CAPMAS)—which collects, processes, analyzes, and disseminates all statistical data in Egypt—and Esri Northeast Africa (Esri NeA), Haile is leading the development of a Geospatial Platform for Food and Nutrition Security. But this is just where his vision begins. Much of WFP’s work in Egypt revolves around promoting good nutrition, and a lot of its projects focus on capacity building. Egypt’s government has strong technical capabilities, but Haile noticed that ministries and other organizations were apprehensive about sharing their data—including CAPMAS, which has the largest amount of and most authoritative data in Egypt. “Their biggest challenge was fear of losing control of their data,” said Haile. So he enlisted Esri NeA to show CAPMAS how it could share its data while still protecting it. “Through that partnership, we basically built the confidence of the government that we were not exposing their data and [that] they were in control of it,” he said. Now, CAPMAS is central to Haile’s goal of getting information into the hands of decision-makers, starting with data on food security. The statistical organization currently houses its public-facing data on the geospatial platform, which officially launched in November 2016. And by the end of this year, Egypt will have released its first-ever paperless census on the portal. This means that anyone—scientists, statisticians, researchers, and government staff members—can access data from CAPMAS and the census and use it. “The ultimate objective is to empower whole segments of society by disseminating the statistics and information and by improving this sort of dissemination using very attractive and very informative tools, such as GIS tools,” explained one of Haile’s key partners in this venture, Dr. Mohamed Ramadan, the research and development adviser to the president of CAPMAS. Now that the data and technology are in place for the geospatial platform, allowing anyone to analyze the drivers of food and nutritional insecurity, the next phase of the project is to get more government ministries involved in data sharing. Each portal will address the needs of the individual ministry. But by following a similar setup as the Geospatial Platform for Food and Nutrition Security, the team will ensure that the various portals are compatible. This will make it easier for the different ministries to work toward common goals, such as achieving the Sustainable Development Goals (the United Nations’ current agenda for eradicating poverty and safeguarding the planet). And that gets to the heart of the project: to foster government-to-government linkages across Egypt and, eventually, share this model with other countries around Africa. “I am demonstrating what can be done at a country level, which can be upscaled to other countries,” said Haile. Haile and his colleagues at WFP and CAPMAS have already hosted a delegation from Ethiopia that wanted to see how the paperless census was going to work. He has also targeted other countries—including Nigeria, Cameroon, Mali, Malawi, and Botswana—as the next batch of African countries that could revolutionize development by connecting their data to location and getting it in front of decision-makers. “My view is, if we work together, then we can work with the decision-makers at the biggest level—at the African Union level,” said Haile. With his technical expertise in GIS and experience living and working in other African countries, it seems that Haile has been building up to this all of his professional life. Originally from Ethiopia, he studied physics as an undergraduate and received his PhD in climate science from the University of Reading in the United Kingdom. While there, he was trying, as he put it, to figure out how to be useful in Africa. “In most places [in Africa], you don’t have observation on the ground,” Haile said, because of geography, poverty, lack of infrastructure, conflict, and the like. So he decided to integrate satellite data with model-generated meteorological data and weather forecasts to make climate studies in Africa more feasible. “I found that to integrate the satellite data with the model data, you needed GIS capabilities,” he recalled. Following graduation, he worked at the university as a research fellow before returning to Ethiopia to use GIS to help the government modernize its early warning system, which monitors the climate, weather, and a country’s food situation to predict drought and ward off famine. From there, he went to Kenya to help the Intergovernmental Authority on Development’s (IGAD) member states strengthen their remote-sensing applications for food security early warning and environmental monitoring systems. Haile then made his move over to WFP, where he became the head of its Vulnerability, Analysis, and Mapping (VAM) unit in Sudan, helping the government build its technical capacity to monitor food security. Then he went to WFP’s headquarters in Rome, where he led the GIS and remote sensing section of the VAM unit. From there, Haile went back to Ethiopia as the deputy director of WFP’s Africa Office in Addis Ababa, where he focused on policy analysis, resource management, and again on capacity building. When Haile got to WFP’s Egypt office, where he spent two years as the deputy country director before becoming the country director, he was finally in a position to connect data directly to the leaders who need it. “Now, I am a decision-maker and have the resources to say what we will focus on, while at the same time, I have the technical understanding to actually demonstrate how policy decision-making and technical capabilities can work together to help leaders deliver on their objectives,” he said. Haile is trying to get governments to see that GIS is not a luxury. “I want to make sure that GIS and data and remote sensing are all part of [government] budgets,” he said, because he believes it is critical for governments to understand geography so they can fully comprehend what is affecting people in their countries and regions. And Egypt wants to contribute its knowledge and know-how from the Geospatial Platform for Food and Nutrition Security project to the rest of the African continent. Which is certainly a win for Haile.